You will earn 5,979 Reward Points. Earn 1 reward point for every 1 dollar spent. Reliability: Reliability and durability are designed from the ground up. High-quality heavy-duty components provide a long life of worry free use in mobile applications. Controls: System controlled by electronic temperature control with automatic defrost, for precise consistent temperatures. Cabinet temperature pre-set at 35°F (2 °C). Powered by simple on/off switch. Temperature Display: “Always-on” analog thermometer is mounted on the door at eye level, for easy verification of internal cabinet temperature, whether the cabinet is plugged in and operating or unplugged and in transit. Performance: All-in-one, bottom mounted refrigerated cassette with environmentally friendly R134a refrigerant. Operating temperature range of 33°F to 40°F (1°C to 4°C). Pre-cooling time to 40°F (1°C ) in approximately 30 minutes. 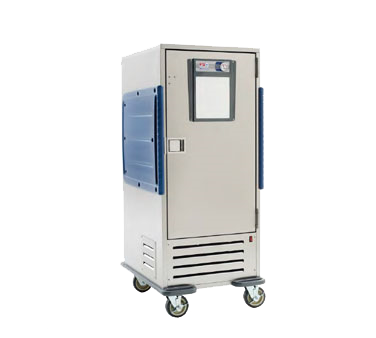 Complete refrigeration system protection against shock and vibration associated with mobile applications. Foamed-in-place polyurethane insulation with Type 304 stainless steel structure provides extreme durability and improved energy efficiency versus common fiberglass construction. Polymer Armour panels are optimally located to protect the cabinet from facility hazards such as door handles and panic bars and to help maintain a cleaner appearance. Molded in vertical handles provide ergonomic grab points for easy handling.